【Max. 4.2kg/9.3lbs Payload】: Empowered by the newly optimized high torque motors and the new generation FOC technology, MOZA Air 2 is capable of handling most DSLRs, mirrorless cameras and pocket cinema cameras weighing up to 9.3lbs(4.2kg), allowing you the freedom to choose from a wider range of camera and lens combinations and accessories. 【Endless Energy】: Can be powered by 4 * 2500mAh high-rate 18650 Li-ion batteries give the MOZA Air 2 a maximum runtime of 16 hours, giving you more pleasant shooting experience. When connected to external power, this will only supply power to the Air 2 gimbal and can not charge the batteries installed in Air 2. 【Smart Time-lapse】: With comprehensively upgraded time-lapse functions, there are up to 20 optimizations helping users easily film various personalized and professional types of time-lapse, such as motion-lapse, tracking time-lapse, zoom time-lapse and so on. All your inspiration can be captured by the MOZA Air2! 【Intuitive Controls】: An intelligent OLED display provides intuitive information feedback, accurately indicates the gimbal status, and helps adjust the gimbal and camera parameters. The joystick, smart wheel, and smart trigger of MOZA Air 2 can be customized to the users tastes. Up to five different user control profiles can be stored and recalled. 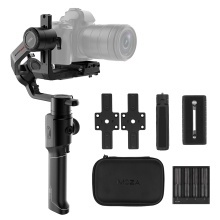 【More Expansion Possibilities】: With 1/4 inch and 3/8 inch screw hole for extending more accessories, the gimbal can be mounted to a tripod, slider or anything else with universal connection. The camera and iFocus follow focus controller are not included.